During the Industrial Revolution, as the United States grew westward, there was great public fascination with America’s unique and varied wildlife. John James Audubon shared that enthusiasm and sought to take advantage of it by portraying these animals in drawings and etchings, which he included in limited edition books. While best known for his precise studies of birds, this exhibition will feature his interest in mammals, most of which were drawn to appear in their natural settings. Easing Audubon’s struggle to accurately recreate these creatures, the animals were often made available to him stuffed and mounted in displays. Audubon’s artworks became immensely popular in England and across the U.S., and remain some of the finest studies of American wildlife in existence. This exhibition is the result of collaboration between the Currier and New Hampshire Audubon, which celebrated its 100th anniversary in 2014. NH Audubon is making their limited edition (1845-1848) Audubon portfolio available for display for the first time in the state. Manchester, NH – America’s westward expansion in the mid-19th century was a story of adventure, but also of profound environmental impact. That story is embodied in the life and work of a man who documented the birds and animals of frontier America. John James Audubon had already achieved fame from his groundbreaking publication, The Birds of America when he set his sights on the country’s mammals. From Birds to Beasts: Audubon’s Last Great Adventure, on view at the Currier Museum of Art from May 23 through August 30, 2015, will take you on Audubon’s 1843 journey up the Missouri River to observe and study some of America’s most iconic creatures. The book he created of mammal studies, The Viviparous Quadrupeds of North America (1845-1848) was a massive undertaking. The three-volume set was the most elaborate color plate book printed entirely in the United States in the mid-1800s. Each copy included an additional three-volume scientific text that provided detailed information about each of Audubon’s 150 subjects. The Currier is partnering with New Hampshire Audubon to present From Birds to Beasts: Audubon’s Last Great Adventure. NH Audubon just celebrated its centennial year and will make their copy of the limited Imperial Edition (1845-1848) Quadrupeds portfolio available for display for the first time in the state. The first edition of this publication, called the Imperial Folio, included 150 hand-colored lithographs, each measuring approximately 22” x 28” and was printed by J.T. Bowen. At the time, 300 people subscribed to this edition, paying $300 (nearly $5,000 today) to receive five prints every two months. The price included binding and the accompanying scientific texts, which were published in 1854. Bowen also produced a smaller Royal Octavo edition (7” x 10.5”), which was published between 1849 and 1871. Like the Imperial Folio, it includes hand-colored lithographs, but Bowen’s team reduced image size by using a camera lucida, making this a more affordable option. By all accounts, John James Audubon’s life was filled with adventure, both in his travels and his financial risk-taking. From Birds to Beasts will detail the factors that led him to create stunningly artistic encyclopedic volumes devoted first to the birds, then to the mammals, of North America. The exhibition will explore the artistic methods behind these massive tomes, and Audubon’s need for the printing and hand-coloring teams to produce works of the highest quality for his subscribers. More than 45 original hand-colored prints will be on view, most of which come from the NH Audubon collection, as will several of Audubon’s popular bird illustrations, made from 1826 to 1838. Six monumental prints by artist Walton Ford (b. 1960) will provide a contemporary connection to Audubon’s 170-year old works. Naturalists from NH Audubon will share their knowledge in the galleries during the course of the exhibition. Over time, Audubon’s name became synonymous with environmental causes even though he and his team killed a large number of animals in their pursuit of scientific study and artistic accuracy. Many of their specimens were mounted and posed in Audubon’s studio as subjects for his paintings to create a visual inventory of the animals that roamed across the frontier. The exhibition includes stuffed mounts of the animals Audubon studied, including popular New Hampshire species such as the bobcat, fisher and fox. Squam Lakes Natural Science Center in Holderness, N.H. lent these mounts for this exhibition. These will be on view in a special gallery space that will allow visitors to draw these animals from observation, in the same way Audubon did. Also, the Currier has produced an Audubon Adventure Journal, a special 32-page illustrated takeaway for all ages that builds off the exhibition’s primary themes of art, nature and adventure. It will offer families the opportunity to learn more about New Hampshire wildlife and how to draw images based on nature..
Born in 1785, John James Audubon moved to Pennsylvania in 1803, the year of America’s massive westward expansion through the Louisiana Purchase. He moved to Kentucky in 1808 and after several failed business ventures, turned to art, science and nature as his life’s work. His first and most popular book, The Birds of America (1826-1838) was printed in England, but by 1836, he was already considering his next masterwork, which would feature America’s mammals. This became The Viviparous Quadrupeds of North America. While he had completed 36 paintings of mammals based on what he saw around his home in New York City, he intended to expand the effort to include America’s unique frontier wildlife. His journey to explore and catalogue these mammals began in 1843, when he traveled to St. Louis and then up the Missouri River to the North Dakota/Montana border. Audubon returned to New York City that fall. Audubon died in 1851 having drawn only half of the 150 paintings included in Quadrupeds. His son, John Woodhouse Audubon, completed the remaining images for the book. The Legacy of Currier & Ives; Shaping the American Spirit pays tribute to the popular nineteenth-century printmakers and their role in establishing a form of mass media that was inexpensive and eagerly sought by ordinary people. The exhibition features sixty-four hand-colored lithographs, which include a stunning array of visual references to an exciting period in national development. From 1834 to 1907, Currier and Ives gave testimony to national art trends, history, and progress through popular prints that hung in homes across America. Several images featured the designs of prominent artists such as Eastman Johnson, Arthur Fitzwilliam Tait, and George Durrie. The exhibition introduces visitors to the firm of Currier & Ives and shows, through interpretive and educational materials, how their imagery became ingrained in the national consciousness. 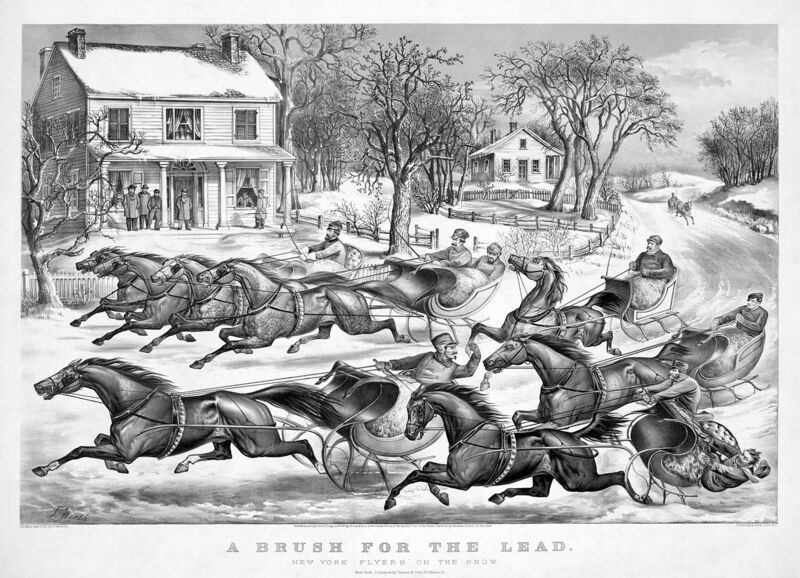 In the seventy-two years that Currier & Ives were in business (1834–1907), they produced more than 8,000 lithographs. An illustrated catalog accompanies the exhibition and is available in the museum shop. The D’Amour Museum of Fine Arts, Springfield, MA, organized and curated the exhibition with prints from their collection.